This exciting new software utility, the result of a joint development intiative between Speech Recognition Solutions and SpeechWare, provides any Windows user the ability to "supercharge" efficiency by adding configurable power to any button, key or lever on any USB Human Interface Device (HID), including USB keypads, hand-held USB microphones, SpeechWare TableMikes, or USB foot pedals. If you'd like to do a "road test" before committing to buying OUC, just click on the link below and download a fully functional trial version which you can try out during 3 uses. If the trial goes well, come back and click on the link below to purchase an activation code. Please not that your purchased activation code provides use of the product for 2 years. If the above link does not lead to a download, an alternative is to go the SpeechWare application download page at: https://www.tablemike.com/applications/#Octopus This will always offer you the most current version. Please note that purchasing OUC entails purchase of an activation code which will be emailed to you within a few hours of placing an order and which allows use of the product for 2 years. The application itself is downloaded from the link above. Your purchase provides you with unlimited use on two computers, 1 year of support from SpeechWare, and 1 year of free upgrades. Please note that your purchase of OUC includes a license which lasts for 2-years. Thereafter you will need to purchase a new license code. For those purchasing from us, we offer a significant discount on renewals. From Homer of Cincinnati, Ohio on 2/11/2018 . Installed on Dragon 13.0, home user edition. Using it with the Power Mic II. Great pickup and allowed custom keys on the controller. From Mark Overman of Tampa, Florida on 6/5/2015 . I purchased this product to use in conjunction with DMPE version 2 plus a Philips Speechmike, XK-3 foot pedal and a 6-in Tablemike. "Out of the box" it worked seamlessly with the Philips Speechmike and the Tablemike but did not work with the footpedal. Techsupport remoted in to my PC and in short time had it working seamlessly with the foot pedal. I found it very simple to program each of my devices. From Bruce Auerbach of Columbus, Ohio on 7/7/2014 . I use this controller with the Phillips LFH 3500 microphone. The program is easy to use and it is easy to program the function buttons. The program is,however, essentially nonfunctional when used with remote desktop protocol, at least as implemented at one of the hospitals I work at. It performs better with remote desktop protocol accessing my office server. I know next to nothing about remote desktop protocol and have no idea why Octopus USB Controller works in one setting but not another. I would strongly recommend against using the Phillips LFH 3500 without also purchasing the Octopus Controller since the program that comes with the microphone is essentially unusable-extreme latency with Dragon NaturallySpeaking and it also caused multiple crashes with my EHR-NextGen. I would also strongly recommend against selling the Phillips LFH 3500 without warning purchaser of this problem. 9/13/2018 – I have a Nuance Powermic III which I use from home over vpn to my office to dictate into Powerscribe with no problems. 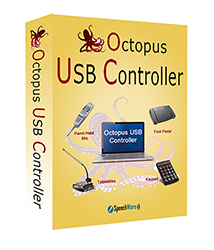 Octopus USB Controller will allow you to program the buttons on your PowerMic III to do any of the OUC functions, regardless of where you are using it ... with one exception. OUC includes some Dragon-specific commands which will work only when it senses Dragon is running. Regarding the profiles question, OUC sets up a separate profile for each device on a given installation of OUC. But the point is for a given install of OUC on a computer, when a particular device is plugged in, it will provide the programming you have set for that device. Your profiles are not networked, so if you install OUC on a different computer (you are allowed two installs with each license) you can assign different programming for a specific USB device on the two installs. You could, for instance, set up entirely different programming for your PowerMic III when logging on from home and when from a separate installation on another computer. On the other hand, if you are accessing everything from one computer, you don't have the option of switching to a different PowerMic III profile when you access another application via VPN. I hope this makes sense. One thing you could do (at an expense) is get a second hand-held mic of a different make (like say a Philips SpeechMike Premium) and program them differently and use them for specific applications. 7/23/2014 – Will this work with a Sennheiser DW Pro 1? My Dragon Medical Practice Edition suddenly turns on after I say "go to sleep" . . . Response From Speech Recognition Solutions: The Buddy Footswitch will not directly interact with the Sennheiser DW Pro-1 or with Dragon. If you combine this switch (or any of the other USB foot switches on our site) with Octopus USB Controller, then it would be possible to use the foot switch to control the Dragon mic (via the software) in either a push-to-talk or push-on/push-off manner.